Did you know “modern antiquarian” bookshops? 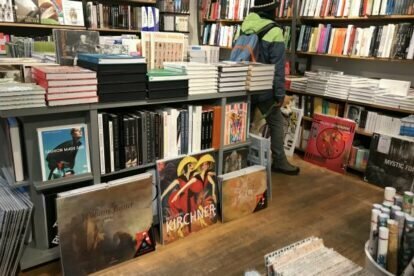 I did not before I stumbled upon this hidden gem in Mitte: LangerBlomqvist curates a big selection of reduced books to offer a sustainable reading pleasure. Sounds like paradise for every bookworm? It is. Not only for the belletristic lovers among us but also hobby philosophers, history nerds, cook book fans and hoarders of coffee table books. The first book I bought there was an art book that usually comes at 100€ and was mine for half the price. What was wrong with it, you might ask. Nothing big: sometimes the cover might be a bit crushed from the transport or the original packaging might be missing, other times it is simply an outdated edition that is no longer sold. You will be surprised how modern the selection still is, how many contemporary authors, titles and special editions you can find for a small price.